Stay up to date with the taproom! Sign up for our monthly newsletter to receive announcements for special promotions, small batch releases, and our weekly events! To make sure you're not a beer thirsty robot, we sent you a confirmation email to complete your subscription! The taproom is made entirely from locally recycled Santa Barbara wood inside the 2,000 square foot warehouse. As you venture deeper into the building you will be exposed to the full operation, complete with a large walk-in fridge, a 15-barrel brewhouse, three 30-barrel fermenters and a 30-barrel brite tank. Adjacent to the taproom is the outdoor patio where you’ll find a bevy of entertainers, such as local musicians and food trucks serving up their finest to happy guests. The Burge’s noticed a demand for outdoor activities, so with a large plot of land and no more hops growing, it was a no brainer to ad league style bocce ball courts to the once hops garden. 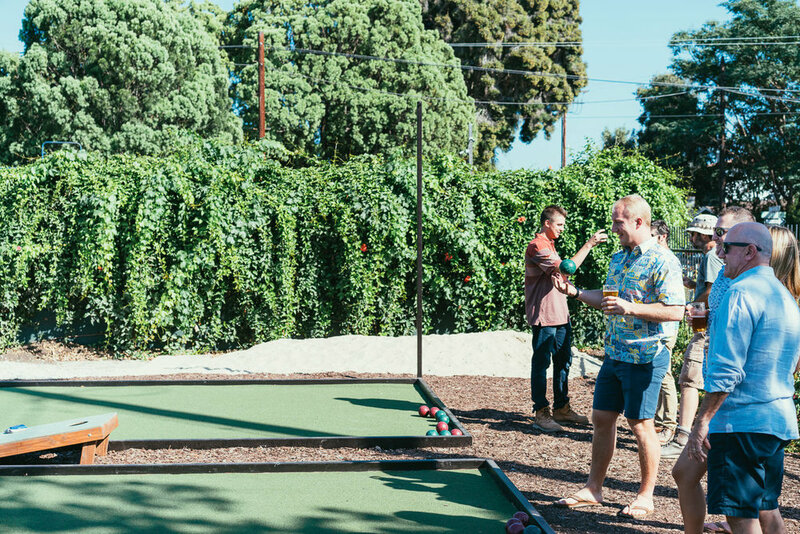 With some help from their local regulars in the summer of 16’ they built two Olympic style bocce ball courts and horseshoe pits to further entertain their beer drinking comrades. Onto the beer: the rich bodied, pale hoppy, and festive seasonal ales and lagers can be tasted in the taproom behind the custom built industrial style rolling doors. Pure Order brew’s can be found all throughout the Santa Barbara coast, extending themselves to the local patrons on shore and to the tourists from all over the world. Being that their beers are highly drinkable and revered by many, Pure Order has an edge that distinguishes their flavors from other breweries. Their quality and dedication to the Reinheitsgebot way is something that separates Pure Order Brewery from other breweries, but not to mention the local entertainment, variety of activities, and dedicated regulars that make it all worth it,. Located just two blocks away from the Santa Barbara shores. At this location the Burge family believes that they can craft a beer and build a company that will infuse itself in the surf and art culture of Santa Barbara and become the embodiment of everything that makes this small little beach town, and its lifestyle, among the most desired in the world. While Dave and James supply only the most exemplary brews, so their crew reflects their product. Next on board we have John Halter who is an ardent beer brewer himself. With a degree in microbiology and chemistry, John is James’ mad scientist in the beer lab and sometimes you’ll catch up sipping on a new concoction at the end of the bar. You'll find either Erika, Jared, Tim, or George behind the bar. With only four bartenders, you're guaranteed to see a familiar face. With such a close nit group of beertenders and friends, it’s only natural that our loyal patrons feel like they’re apart of the crew themselves! We strive to create an environment with a warm friendly feel for our guests, that when after a hard days work, a pint with the Pure Order family feels like home. You can also find the crew around the coast traveling in their trusted baby blue dropping off keg deliveries. The delivery girl, Baby Blue, is Pure Orders vintage 1977 Volkswagen. Blue has been with the Burge family since the beginning when James stumbled upon her, written off with a pink slip in downtown LA. So with a tow-truck and open mind he welcomed Blue into the Burge family, reviving her with a new paint job, new tires, and a revved up engine. You may have seen her cruising around downtown Santa Barbara making deliveries at her favorite local bars, markets, and restaurant. When not making deliveries you can find Blue parked outfront, staking her claim right out front of the brewery doors, to be sure she's seen by the bystanders.